Wednesday 27th June 2018 – at the club meeting, Kim Ann Williamson MBE Chair of UK Modern Slavery gave a detailed account of the work of Anti-Slavery campaigns in Wales and UK detailing the valuable input of Sorooptimist International in the UK. Stands were held at the Senedd, CP2 and Waitrose in Pentwyn. 8 helped man the stands in pairs on a rota basis. On International Non Violence Day, Ann and Joan were privileged to meet Mahatma Ghandi’s great grandson, Satishkumar Dhupelia who was in Cardiff from South Africa for the unveiling of the statue of Ghandi funded by the Hindu community in Cardiff. 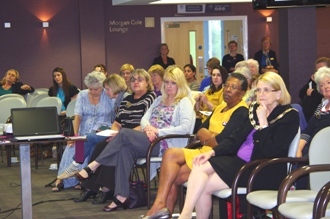 He was knowledgeable about modern day slavery and complimented Soroptimists on the activities associated with MDS. SI Cardiff & District has taken a keen and key interest in Human Trafficking since 2012 when the club’s then president Dr Joan Williams held a conference in Cardiff. Details below. See https://sigbi.org/ukpac/our-work/ club member Dr Kay Richmond is the UKPAC Chairman and sits on the UK Modern Slavery Training Delivery Group. Club member Dr Joan Williams sits on the SI Wales South Modern Slavery Group and succeeded inaugural chairman Dr Kay Richmond, a position Joan held until January 2016..
18th October 2016 – Three representatives from SI Cardiff & District, President Ann, Drs Joan Williams and Kay Richmond attended the Wales Antislavery Group’s Conference conference at the Celtic Manor Hotel. Topics included dealing with Forced Labour and Victim Support. Other Soroptimists were present, representing the 6 Regional Anti-Slavery Groups in Wales. October 2015 – The North Glamorgan NFU ladies continue their awareness raising of modern day slavery in Rural Areas see photo above taken at their meeting. Saturday 17th October 2015 – Members of SI Cardiff & District joined other members from SI Wales South for a walk along the prom at Aberafon to mark and raise awareness of Human Trafficking at the beginning of a week of events across Wales. See – NFU Cymru Llantrisant – campaign against human trafficking On Thursday 15th October 2015 SI Cardiff & district met with the NFU Cymru to raise awareness of human trafficking especially in rural communities. On Saturday 15th August 2015 members of SI Cardiff along with family and friends boarded a coach at Whichurch and headed off for a trip To The National Botanic Gardens of Wales to join with fellow Soroptimists at a fundraising event for the three main charities involved with victims of human trafficking in South Wales, BAWSO the Salvation Army and New Pathways. We had the opportunity to wander in the gardens before the event was opened by Dame Rosemary Butler AM for Wales who shared with us her route from motherhood to Presiding Officer of the National Assembly for Wales an interesting story and she encouraged all Soroptimists to share our numerous and varied skills with Welsh Women who are starting out in their chosen professions. We then watched the film SOLD by the Theatre Against Oppression. Before the film was shown a message of support by Michael Sheen was introduced by Regional President Sue Walker.The film was hard hitting and the content surprised many of the audience some of whom were visibly shaken to realise that these issues are in the ‘here and now’. Steven Chapman, The Anti Human Trafficking Co-ordinator closed the event and praised members for the work already undertaken by our organisation. SI Cardiff had two tables one showing projects undertaken; the other selling books and craft items which made a total of approx. £130 Thank you to everyone who contributed and to Giselle for manning the stall throughout the event. Dr Joan Williams was particularly proud of the support from SI Cardiff as there were 30 members and friends from her club amongst 100 attendees and would like to thank those who came to support the event. The total funds raised is not yet finalised but will be in the region of £1,000. £450 has also been donated to Barnardos for their anti trafficking section. On Wednesday 4th July 2012, a seminar, meticulously organised by President Joan was held in the Morgan Cole lounge of the SWALEC stadium Cardiff. The title was Human Trafficking, Modern Slavery. Details of the evening had been circulated to all SI clubs and interested parties from a wide range of professions and backgrounds. The 159 who attended could not have failed to have been deeply moved by the plight of trafficked persons. The evening was chaired by Emma Kwaya-James from Barnardo’s Cymru. There were five speakers who spoke about different aspects of this despicable ‘low risk, high benefit crime.’ The crime is of low risk to the traffickers but highly beneficial financially. The risk is low as so few are prosecuted, a fact that all who contributed are determined to change. Trafficked people come from countries in Africa especially Nigeria, Eastern Europe and countries in Asia e.g.Thailand. The first speaker was Cardiff City & County Councillor Kirsty Davies. Until recently, Ms Davies was a member of Cardiff’s Executive Council with responsibility for Trafficking for the purposes of sexual exploitation. She has a broad knowledge in this area and of the complexities it presents. Robert Tooby entitled his talk Human Slavery across Wales in the 21st century. 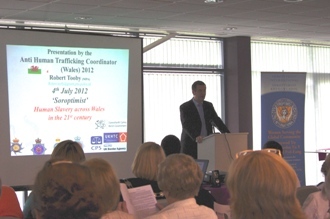 Mr Tooby, a retired police superintendent, is the Wales Co-ordinator on anti Human Trafficking. Most trafficked people enter the country willingly i.e. are not kidnapped but come under false pretences such as a promise of a job. Most have their passports taken from them by the traffickers and are exploited sexually or by being made to work for little or no money such as in massage parlours or nail bars. Dr Mwenya Chimba Violence Against Women Director for BAWSO works towards the prevention, protection and provision of help for victims of violence against women. She leads the Diogel project which supports people who have been trafficked for exploitation. Liam Vernon is Deputy Head of the UK Human Trafficking Centre for the Serious Organised Crime Agency. He is a member of a number of groups, nationally and internationally to help tackle Human Trafficking in its various forms. Traffickers use ports all over the country. Many come via Ireland into the Welsh ports of Pembroke and Holyhead. The final speaker was Sheila Taylor MBE Director National Working Group for Sexually Exploited Children and Young People. She has worked closely with trafficked women and girls making the poignant point that children in this country can be internally trafficked highlighting children (boys and girls) who are lured from vulnerable homes and end up being sexually exploited. The evening concluded with the speakers forming a panel answering the many questions those present. There were no happy endings unfortunately and most left feeling very subdued but certainly much more informed. The purpose of the evening was to raise awareness and all came away feeling knowledgeable and aware of the awful fact that those exploited may well live in any area in any part of the country. We hope the event made a positive contribution to awareness and understanding, and provided some ‘ammunition’ to fight Human Trafficking in the South Wales area. At the end of the evening a bucket collection raised £200 for charities who work with victims of trafficking.